This months Pi jam was a real gem, lots of things being demoed and some excellent progress being made with various projects. 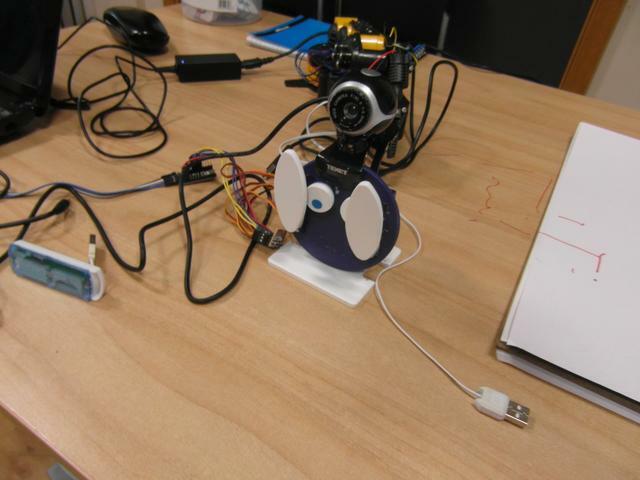 Tom, brought along his Marco 2 robot, which if you are following this blog or are a regular attendee of jams. This has now been updated to allow control via a web interface. More information on this is on the Feb 2015 Exeter Jam write up blog post. So I will let people go there for more info. Tom also brought along Freddie and after some basic set up this worked fine, following a green ball with his eyes. 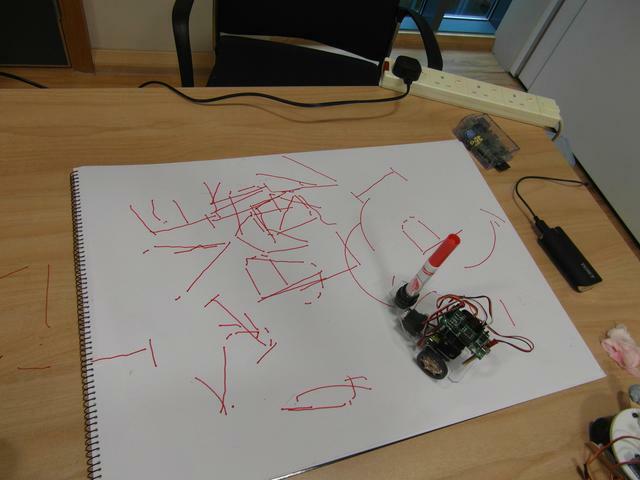 Doodle bot also made an appearence this is really good as it works without any user interaction and can draw (or try) to draw what it has been programmed to. 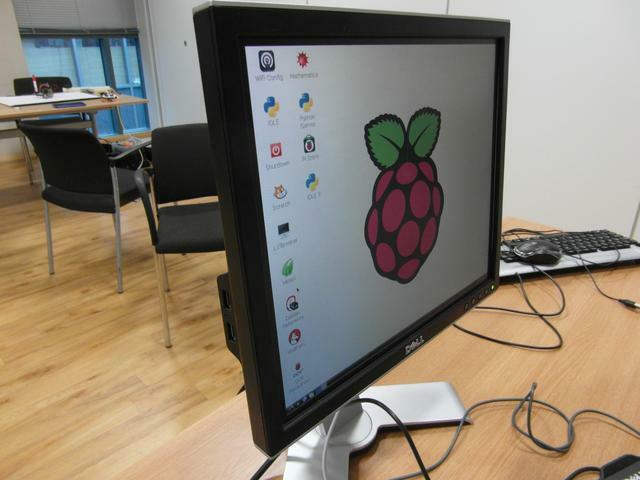 And a picture of the pi running the Raspbian OS after install. 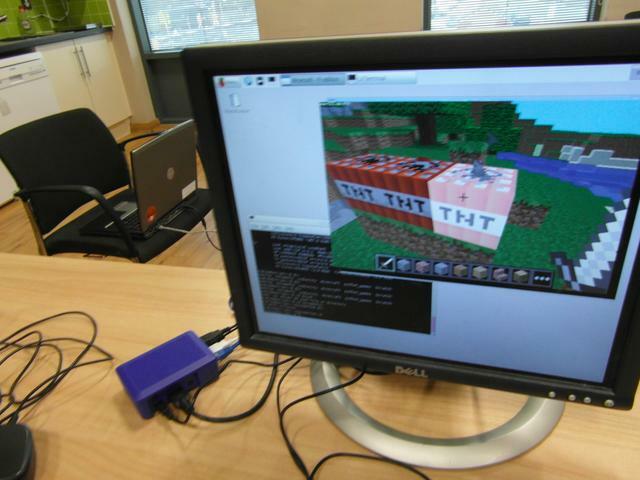 I also demonstrated my Minecraft Pi coding with python. I will post a video to youtube and put this on my website blog. 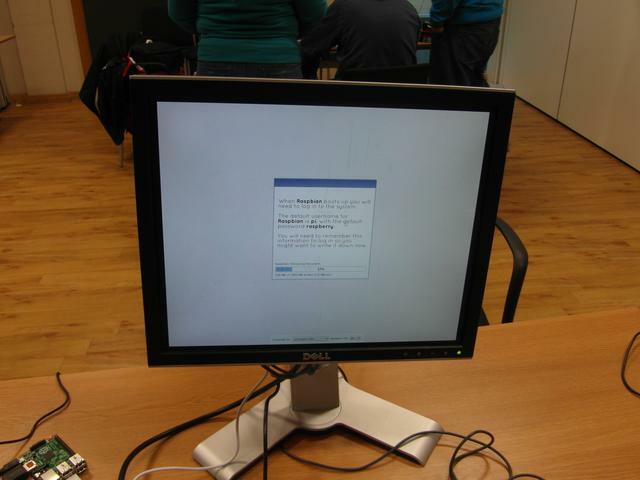 We also helped out a user who had an older install of GNU / Linux on his PC (Debian) and wanted a newer GNU / Linux installed so flash player would function properly. One of our younger members also worked on getting a cluster of computers up and running and thanks to a router / switch donated by Rick at Wifispark he got 2 laptops and my Pi up and running and proved that by sharing the load calculations can be performed quicker. There is a dedicated page for this on the website. Where results will be posted shortly. We also had a Dan from the TDA drop in to see what was going on with the view on how they can help further and perhaps involve some of the local hi tech companies. So a BIG thank you for everyone involved today and everyone who came along to support the event. Hopefully next month will be more of the same and perhaps even bigger and better. We also had Sarah from Inspiring Dreams, Achieving Change, who offered to help promote what we are doing. The word on the Pi jams IS spreading. which is a good thing. Help with getting started with programming or provide advice on the next step for example where to go after using scratch. We also try and advocate other groups and initiatives that may be of interest to young people: for example Young rewired state, coder dojos, after school clubs. Promote events for adults for example hack4good events or hackathons on services such as geekli.stWe can also help with Linux user group related activities such as install and set up help for Linux. Advice on software or general discussion on related issues.Promote and advocate the use of free and open source software and the work of the Free software foundation Europe..Advocate and promote the new school Computer science curriculum. Enguage with parents, students and teachers in order to facilitate support if needed.Promote STEMnet and Stem activities. Free giveaways such as stickers if available, copies of Linux cd’s again when / where available. The Arm DS Development tools is now available for Debian. The ARM® DS-5 Development Studio is a professional toolchain developed by ARM to accelerate the development of native (C/C++) Linux applications. 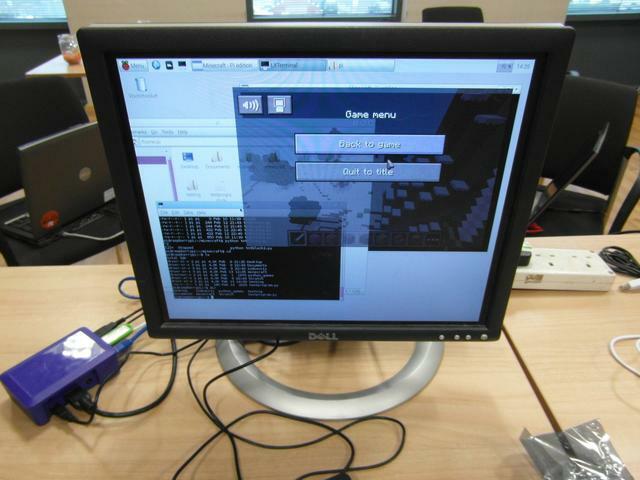 It is available free of charge to Debian Developers and offers 32-bit (armel and armhf) and 64-bit (arm64) ARM application debug and system analysis to help make Debian packages robust and highly optimized for ARM processor-based devices. Learn more about Streamline performance analyzer and DS-5 Debugger.